I don’t want this to be read as a negative review, but there were things Carnival Australia could improve on. We cruised on Carnival Legend ex Sydney 17th Dec 2018 for 10 nights to Pacific Islands. This was our 11th cruise holiday (Cunard, 2xRoyal Caribbean, 2x Princess, MSC, 2x P&O Aust, P&O UK and Carnival Caribbean). So we have other cruises to compare this with. We were warned Carnival Australia was considered more budget conscious, and we were happy with that, but didn’t expect their penny pinching to be so blatantly obvious. It started within minutes of us boarding the ship and making our way to our stateroom. Our room attendant welcomed us and showed us around, before he asked if we’d like our room serviced in the morning, OR the afternoon. 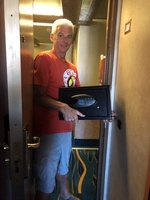 All previous cruises, our room has been serviced twice a day. Not on this ship. For breakfast I like a muesli. In the Unicorn buffet, there were Corn Flakes, Rice Bubbles, Cocoa Pops, All Bran. No muesli. So on the 1st morning, I asked, just in case I had overlooked it. I was told yes, they had it over at the “Continental” counter. Oh yes they had it, but it was hidden under the counter, out of sight. Some days I was told they’d run out, then it reappeared the next day. So I spoke to a crew member dressed all in white (unsure of his position, but he was involved in the restaurant or the food). I then got it every morning after that. But it was always hidden, under the counter. The only reason I can think why it was hidden is muesli is a lot more expensive than the other cereals available. It was summertime. Think of all those lovely summer fruits. Strawberries, apricots, nectarines, peaches, plums, pineapple. Yum. But not on this ship. At the breakfast buffet you had the choice of various types of watermelon, prunes and I recall canned peaches. I did see whole apples, oranges and pears. Guess what. The other summer fruits cost more. I like kiwifruit with my muesli. Not on this ship. Prior to the evening dinner, we would always go to a bar for a drink. Most other ships, we’ve been given complimentary nibbles with our drinks. It doesn’t have to be much – just a saucer full – but not on this ship. Lunchtime, I like to have a salad. Yes, they had lettuce and tomato, grated carrot, corn etc, but nothing special. I cannot exactly remember now, but I was struggling to find other foods to put on my plate. Before bedtime, I like a cuppa tea and a bikkie. I’d go to the Unicorn buffet and get a cuppa tea but there was nothing else to nibble on except a freshly made pizza!!! During the day they had nice little cookies available to have with a cuppa, but not later in the evening. Whynot? They had a kiosk machine guests could check their onboard account. Opening a new bank account would be easier. I thought the machine was going to ask for a blood sample. Ridiculous. We gave up. A suggestion box in Guest Services area may have been helpful. Some guests complained some of the dishes served at Truffles Restaurant were never hot. By the time they were delivered to the table, they were warm +. I personally didn’t have a problem with this, but some did. ON THE POSITIVE SIDE. We did have an issue with some noise in our room during the early hours of the morning. Anytime from 2am – 4.30am. We spoke to neighbouring rooms and they heard it as well. We could never pinpoint its origin exactly, but we guess was it was coming from the Unicorn buffet (we were the floor below it) and the noise was travelling through the air conditioning system. When we contacted room services, Carnival Legend never questioned our reports and compensated us very generously. We assume it’s an ongoing issue for guests in these rooms. Everything was clean and tidy on the ship, all the staff were excellent and I was happy with the food in Truffles Restaurant. Would I go Carnival Legend again? YES I would (but if there was another cruise line doing a similar cruise, I would choose the other cruise line). I think Carnival could improve some of the things I’ve mentioned, without costing them too much extra. An ‘enjoyable cruise’, could become a great cruise. I don’t want this to be read as a negative review, but there were things Carnival Australia could improve on. We cruised on Carnival Legend ex Sydney 17th Dec 2018 for 10 nights to Pacific Islands. This was our 11th cruise holiday (Cunard, 2xRoyal Caribbean, 2x Princess, MSC, 2x P&O Aust, P&O UK and Carnival Caribbean). So we have other cruises to compare this with. We were warned Carnival Australia was considered more budget conscious, and we were happy with that, but didn’t expect their penny pinching to be so blatantly obvious. It started within minutes of us boarding the ship and making our way to our stateroom. Our room attendant welcomed us and showed us around, before he asked if we’d like our room serviced in the morning, OR the afternoon. 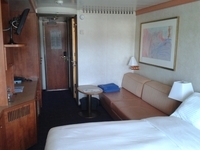 All previous cruises, our room has been serviced twice a day. Not on this ship. For breakfast I like a muesli. In the Unicorn buffet, there were Corn Flakes, Rice Bubbles, Cocoa Pops, All Bran. No muesli. So on the 1st morning, I asked, just in case I had overlooked it. I was told yes, they had it over at the “Continental” counter. Oh yes they had it, but it was hidden under the counter, out of sight. Some days I was told they’d run out, then it reappeared the next day. So I spoke to a crew member dressed all in white (unsure of his position, but he was involved in the restaurant or the food). I then got it every morning after that. But it was always hidden, under the counter. The only reason I can think why it was hidden is muesli is a lot more expensive than the other cereals available. It was summertime. Think of all those lovely summer fruits. Strawberries, apricots, nectarines, peaches, plums, pineapple. Yum. But not on this ship. At the breakfast buffet you had the choice of various types of watermelon, prunes and I recall canned peaches. I did see whole apples, oranges and pears. Guess what. The other summer fruits cost more. I like kiwifruit with my muesli. Not on this ship. Prior to the evening dinner, we would always go to a bar for a drink. Most other ships, we’ve been given complimentary nibbles with our drinks. It doesn’t have to be much – just a saucer full – but not on this ship. Lunchtime, I like to have a salad. Yes, they had lettuce and tomato, grated carrot, corn etc, but nothing special. I cannot exactly remember now, but I was struggling to find other foods to put on my plate. Before bedtime, I like a cuppa tea and a bikkie. I’d go to the Unicorn buffet and get a cuppa tea but there was nothing else to nibble on except a freshly made pizza!!! During the day they had nice little cookies available to have with a cuppa, but not later in the evening. Whynot? They had a kiosk machine guests could check their onboard account. Opening a new bank account would be easier. I thought the machine was going to ask for a blood sample. Ridiculous. We gave up. A suggestion box in Guest Services area may have been helpful. Some guests complained some of the dishes served at Truffles Restaurant were never hot. By the time they were delivered to the table, they were warm +. I personally didn’t have a problem with this, but some did. ON THE POSITIVE SIDE. We did have an issue with some noise in our room during the early hours of the morning. Anytime from 2am – 4.30am. We spoke to neighbouring rooms and they heard it as well. We could never pinpoint its origin exactly, but we guess was it was coming from the Unicorn buffet (we were the floor below it) and the noise was travelling through the air conditioning system. 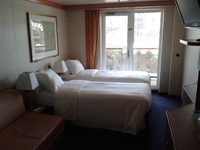 When we contacted room services, Carnival Legend never questioned our reports and compensated us very generously. We assume it’s an ongoing issue for guests in these rooms. Everything was clean and tidy on the ship, all the staff were excellent and I was happy with the food in Truffles Restaurant. Would I go Carnival Legend again? YES I would (but if there was another cruise line doing a similar cruise, I would choose the other cruise line). I think Carnival could improve some of the things I’ve mentioned, without costing them too much extra. An ‘enjoyable cruise’, could become a great cruise.